Salad: not just iceberg lettuce and chickpeas anymore. From one salad with raw meat to another with raw fish, here are a few ways local eateries are redefining what constitutes a salad — and reinterpreting the classics — in entirely new ways. The menu changes often at Black Sheep (based on what’s in season and available, as local ingredients are a focus). But Beets 5 Ways ($12) makes a regular appearance. 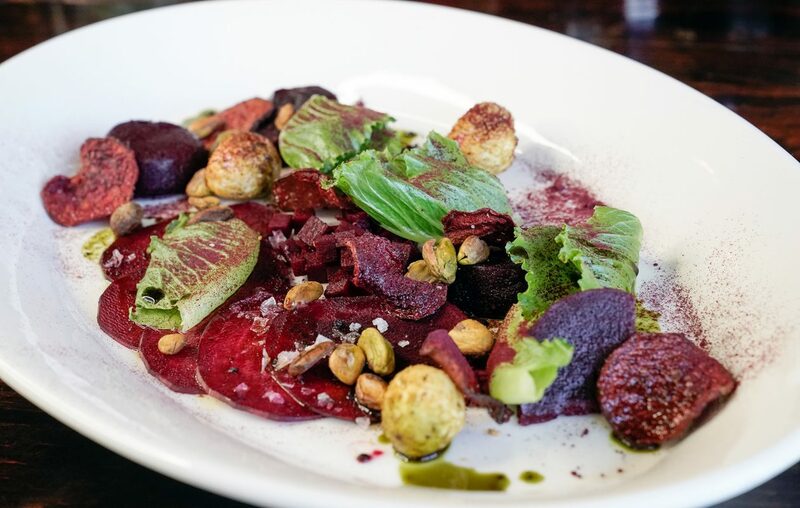 That’s good news for Buffalo, because once you have this mix of pickled and roasted beets with creamy goat cheese, pistachios, carpaccio and more, you’ll want to know you can get it again. Poke, a traditional Hawaiian dish featuring raw fish and strong Japanese influences, is just starting to hit the Buffalo culinary scene. Haven’t tried it yet? Go with the Ono Bowl from Fresh Catch Poke ($11). It comes with fresh Hawaiian nairagi (tastes similar to a heartier fish like tuna), mixed with jasmine rice, onions, spicy jalapeno, carrots, juicy pineapple, peas, tobiko (flying fish roe), and spicy ponzu (a sauce traditionally made with salty soy sauce, vinegar, lime and fish flakes). Arugula, shaved red onion and gherkins — topped with quail eggs — complement the raw beef in this special salad ($13) from 31 Club. Russell’s is known for excellent service and quality food, and that extends beyond steaks and chops. The Wedge Salad ($10) is a great start to a decadent dinner — an artful presentation of iceberg lettuce paired with red onion, fennel slaw, hard boiled eggs, tomatoes and a drizzle of bacon mustard dressing. Yes, there is a Beatles-themed restaurant in Clarence. And despite a region filled with great Italian restaurants, they are known for their signature Antipasto Salad ($15-$21). Mixed greens are topped with cured Italian meats, shredded cheeses, cucumbers, artichokes, peppers, onions, and more, dressed with a house made Italian. Historic tavern Gene McCarthy’s Reuben Salad ($10.50) is like St. Patrick’s Day in a bowl, combining tender corned beef, Swiss cheese, crisp sauerkraut, greens and a generous portion of Thousand Island dressing. Big Ditch has won over locals with their specialty beers, but don’t forget about the food. Not your typical pub fare, there are plenty of veggie-inspired dishes. The Cobb Salad with smoked salmon ($13) is loaded with hard-boiled egg, blue cheese crumbles, spicy red onion, creamy avocado, crisp bacon and plenty of romaine lettuce. It’s all drizzled with fresh lemon vinaigrette. Known for classic Greek food like stuffed grape leaves and souvlaki, the Surf and Turf Salad ($15) is one of their more American-diner inspired offerings. Juicy, grilled gulf shrimp and a five ounce NY strip steak (cooked to order) top plump portobello mushrooms, crunchy walnuts, feta cheese, raisins, roasted pepper and plenty of mixed greens. This option turns the classic sandwich into a tasty, far-from-boring salad, with plump juicy tomatoes, crispy bacon, chopped lettuce plus a few non-sandwich accouterments like cucumbers, croutons and a creamy avocado dressing ($9-$15).